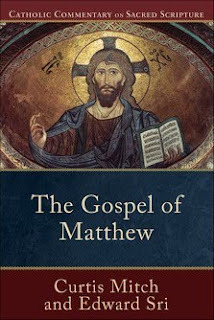 Just in time for the liturgical year 2011, which is year A for the Sunday Gospel readings, Baker Academic will be publishing the fifth volume of the Catholic Commentary on Sacred Scripture series on The Gospel of Matthew in December. This volume will be co-authored by Curtis Mitch, known for his work on the Ignatius Catholic Study Bible, and Edward Sri, known for his publications with Emmaus Road. Of course, for more information about the entire Catholic Commentary on Sacred Scripture series, you can go here. I have all the volumes published to date and find them very helpful. I think that one of the great gifts of this series to the Church is found in its inclusion of scholars from various "schools of thought". It has received positive reviews from a wide spectrum (theologically speaking)of biblical scholars.